My favorite pop chamber trio, Pearl and The Beard, are playing a big headlining show tonight (Jul 7) at Brooklyn’s very own Music Hall of Williamsburg (Buy Tickets). It should be a great night for a lot of reasons: it’s a hometown show, Franz Nicolay and Brian Bonz will be there, it’s the last official show of their Killing The Darlings tour, and it’s their biggest headlining gig to date! 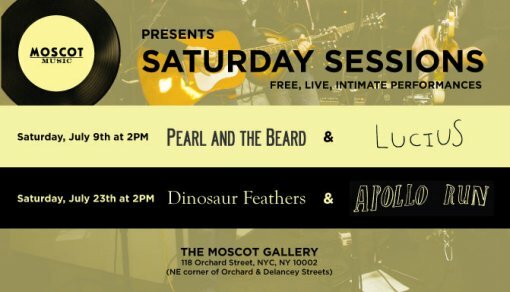 If you absolutely can’t make it out tonight, you can also catch PATB on Satuday, July 9 at The MOSCOT Gallery (118 Orchard St at Delancey) for an acoustic session at 2PM. More Pearl and the Beard tour dates and a MOSCOT Saturday Session flyer after the jump. Present this flyer at a Moscot Saturday Session to receive 20% off all MOSCOT eyewear.